Field, reservoir, sapling, sprout; wellspring, trough, trench, and pit. When reflecting on the placeness of Laishihai and her surrounds, one immediately recalls the shapes, the angles, the particulars all splayed out and sharp before you. This is what it means to come to a place you have never been. To deliver your body, every breathing and ecstatic part of you, and pitch deeply within the aliveness of a world you have never known before. We wanted to translate this experience of wild submersion and sensory newness into an immersive photography project that would, firstly, activate our connection to the place and the landscape; and secondly, act as a tool for sharing the concept of “placeness” intuitively and non-verbally with our hosts. 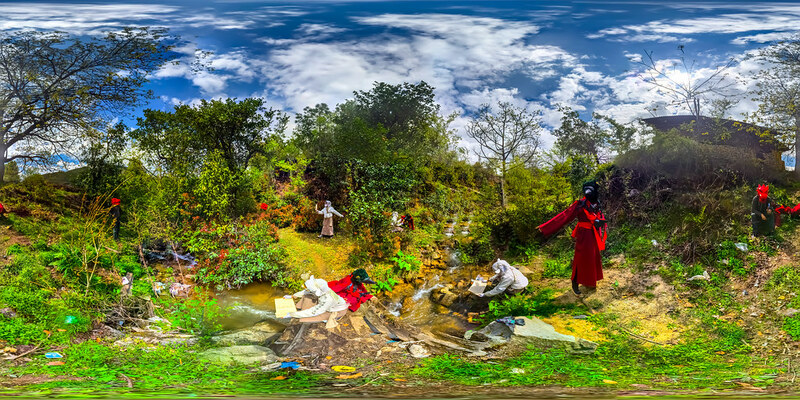 We chose to create a series of photospheres—the most humble and widely accessible application of virtual reality tech, cobbling together VR viewers out of plastic lenses and found materials like cardboard boxes and corncobs. Creating photospheres allowed us to document the landscape in relation to embodied experience: the technology allows you to capture what it is like to squint up into the sun; to see the human shadow fall against the lines of blooming crop trees; to really feel the quiet solidity of how the body takes up space, what it is like to really look. Inspired by the Qilin puppets, props, and costumes we saw, we began exploring making our own costumes and performances. The spheres let us activate these characters and stories within the landscape. We acted out different scenes, intentionally alternating eeriness with everydayness, and dissolving constructed boundaries between the real places we inhabited and the fictive interactions we imagined.